It was a beautiful early spring day. The sky was cloudless, and the temperature was perfect for an outing. My husband and I decided to visit the zoo in our town. 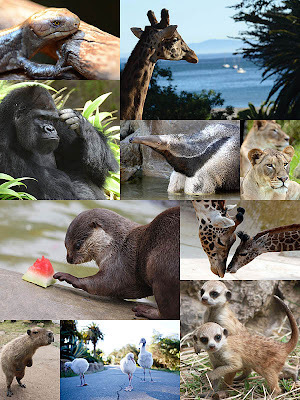 We had not been to the zoo in several years, so we were astonished at the changes and improvements. Everywhere we looked, plants were ready to bloom. Animals were stretched out enjoying the warm sunshine. As we strolled around, we would often stop and sit on a bench just taking in God’s beautiful world. It was calming just to sit and think about God, our Creator. How blessed we are to be surrounded by His beauty. “We serve a powerful God,” I said to my husband. His reply was, “And we so often take Him for granted.” His statement is so true. If we don’t watch ourselves, we spend our prayer time asking God for something instead of thanking Him for what He has already doing for us. We sometimes tend to treat God like a Coke machine—give me this and this, God. We sat in silence just contemplating God’s greatness. I felt as though I was walking hand in hand with God as I observed His plant and animal kingdom. I sensed His presence with me. This trip to the zoo was just what I needed. Earlier that day I was feeling frustrated and anxious over my responsibilities. We certainly had no plans to go to the zoo, but I know now that God knew I needed that time with Him. I know that He put that idea into my head. Do you know why this day was so good for me? I stopped! I stared at nature! I took time for God! No wonder I felt so much better after we left the zoo. My mind was clear. My anxieties were gone. Why not take a break today and spend some time just looking at the beautiful world God has created for us. It will calm your anxieties.